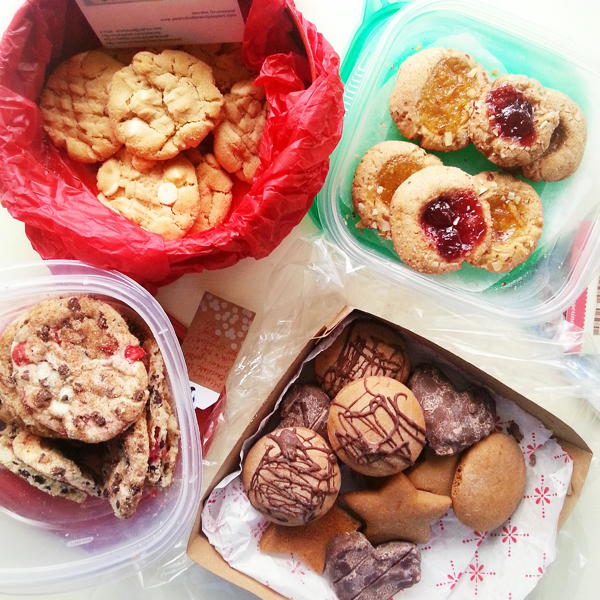 Last year I forgot to sign up for the Great Food Blogger Cookie Swap. I just totally missed the sign up deadline! I was so bummed. But I wasn’t about to let that happen again. As I’ve mentioned in previous posts, cookies are not typically my forte. They just don’t ever turn out like I want them, but these? I think it’s safe to say they’re the better of the cookies that I’ve made. I’ve been dying to bake with Nestle’s new filled chocolate chips, so I finally bought a couple bags of the peanut butter filled baking morsels and decided this was the perfect opportunity to use them! You know, after I ate like half a bag. 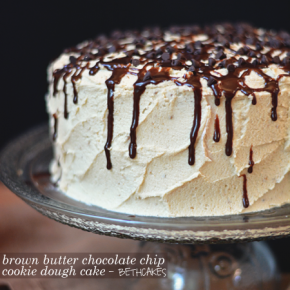 There’s also peanut butter in the actual cookie dough, as well as drizzled on top. The first time I made these cookies, I wasn’t thinking and mailed them before I took photos, so I made them again and decided to throw in the drizzle and some extra peanut butter morsels. I just couldn’t stop with the pb! So, to Jenni, Melissa, and Meghan, I hope you enjoy the cookies and that they made it to y’all in one piece! They great thing about all the various cookies I got is they were all completely different. I received Thumbprint Jam Cookies from Turnips 2 Tangerines, Peanut Butter White Chocolate Chip Cookies from Peanut Butter & Peppers, Polish Gingerbread Cookies from What’s on the Plate, Mexican Hot Chocolate Sugar Cookies from Chicago Foodie Girl, adorable Candy Cane Mollomars from Wilde in the Kitchen, and Red Velvet Candy Cane Kiss Cookies from DelightfulEMade. These were all so wonderful, and mix up or not, I’m so glad I received each one of them! They were delicious and I had to share them with anyone I could so I wouldn’t eat them all. Thank you to each one of you! Combine flour, baking soda, cocoa powder, cream of tartar, and salt in a bowl and whisk together. In the bowl of a stand mixer, or a large bowl with a hand-held electric mixer, beat butter on medium speed until smooth and creamy. Add peanut butter, sugar, and brown sugar. Mixed until combined and fluffy. Add vanilla and eggs and mix well. Add half the flour mixture and mix until incorporated. Repeat with the second half of the flour. Add the peanut butter filled chocolate chips. Cover and place the cookie dough in the refrigerator for about half an hour. Preheat the oven to 350 degrees. Scoop the cookie dough into balls and place on the prepared baking sheets about 1 inch apart. Bake for 11-12 minutes. Let the cookies cool for 5-10 minutes and repeat this process with the rest of the cookie dough. If you'd like, you can also add peanut butter morsels and drizzle the cookies with melted peanut butter morsels after they've cooled. And these … peanut butter filled? I’ll take a dozen please and thank you! Uhh yeah, A LOT of cookies. haha:) Thanks, Ashley! Peanut butter and chocolate are my favorite. 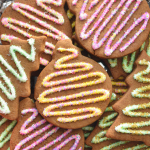 These cookies are sure delicious! These cookies look awesome, Beth! And I’m so happy I remember to sign up this year too heehee. 😀 Cookies for everyone! All the cookies you received look delicious, and I want to stuff my face with your chocolate PB ones! 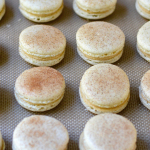 I’ve been wanting to try those filled Morsels too, I think I’ll need to grab a bag and whip these up. Pinned! You NEED to try the filled morsels! They are addictive. 😉 Thanks for pinning, Rachel! Oh man these look so good! 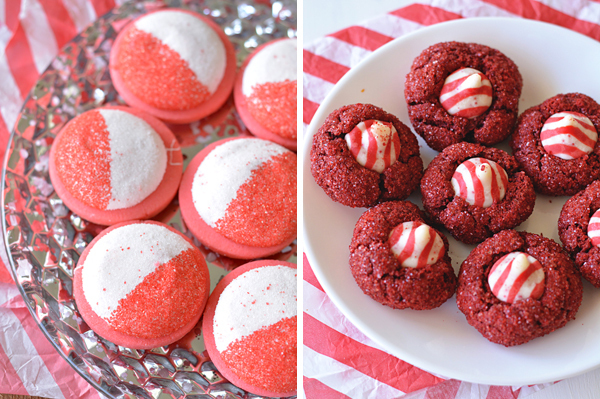 I have done the Great Food Blogger Cookie Swap every year until this year! I was so sad to see that I had missed the sign up deadline. I honestly don’t know what happened. You can bet I won’t miss it next year! One of my FAVORITE flavor combos. This cookies rock!!! 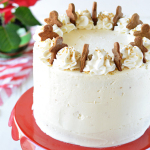 I love the frosting stripes on top. A hint of what to expect. Now that is a cookie swap! 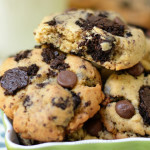 Very delicious looking cookies! Cookie overload! They were all so good! Oh! If I had a plate of mixed cookies in front of me, I would choose THESE! They look like my favourite cookie ever! 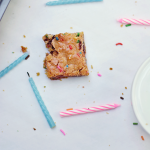 You had yourself a cookie feast! You lucky, lucky gal. This was my first year participating in the fun. Your recipe looks amazing! Whoa! They all look so good! Is there anything better than a classic peanut butter and chocolate combo! Oh my gosh. I want a dozen of these babies!! LOVE. Pinned! Wow, how did you get so lucky with six boxes of cookies! 🙂 They all look delicious and so do these peanut butter filled cookies. Chocolate and PB is the best combination. I wouldn’t be able to stop eating these! I wish I was one of your recipients says Mr J. These peanut butter cookies will be gone in no time here! 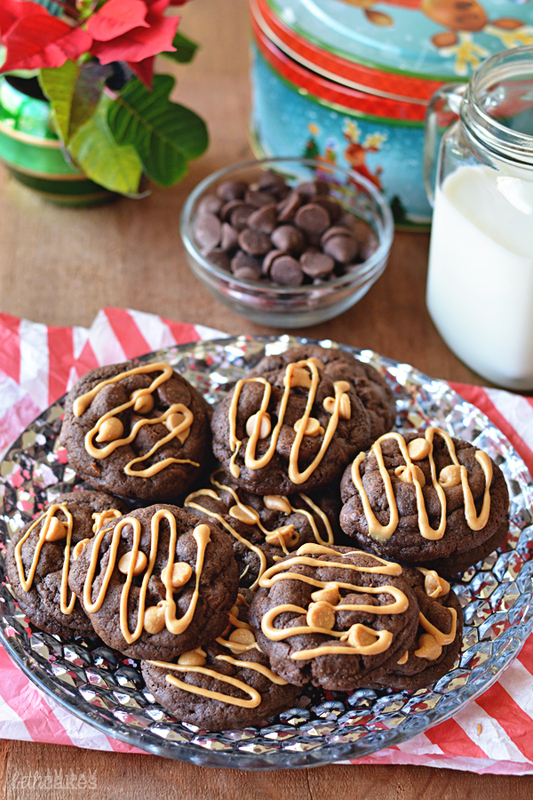 Can’t go wrong with peanut butter chocolate cookies! I would have loved to have received a box of these! 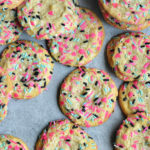 These cookies look so rich and delicious! You lucky duck you! Six boxes of cookies sounds like a real treat! And so do these delicious cookies, wish i could have been one of your matches!